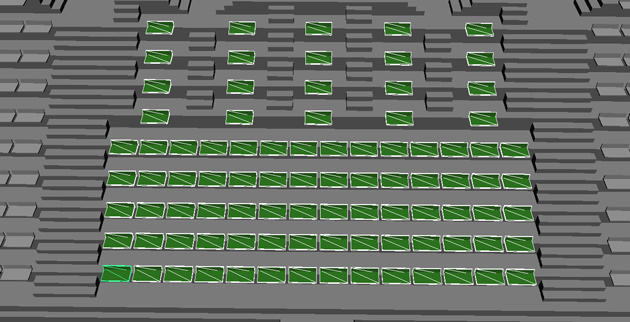 The basic workflow details how to quickly populate a stadium. This is the method we already exposed. Select faces in your geometry and choose the "Selected object or component" mode in the Population Tool Creator Tool Panel. See here for more details. 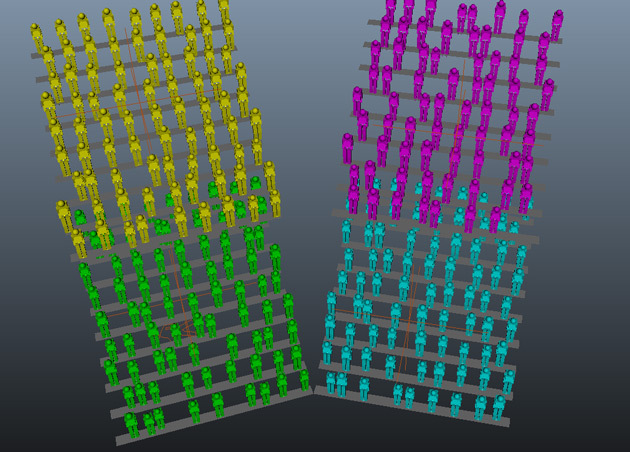 For stadiums which seats are individual meshes, you can select theses meshes and place people relatively to the mesh pivot. Then click on the Golaem Crowd Population Tool Creator , and select the "Selected object or component" mode in the Tool Settings panel. Usually the pivot of your seat object is centered on the seat, but it is not always what you want. For example if you generate standing supporters, they will be standing inside the seats, which depending on your camera angle can be a very big problem. In those cases, do not forget that you can either change the pivot of your object before populating the stadium, or move the whole population tool using the usual Maya Translation tool. 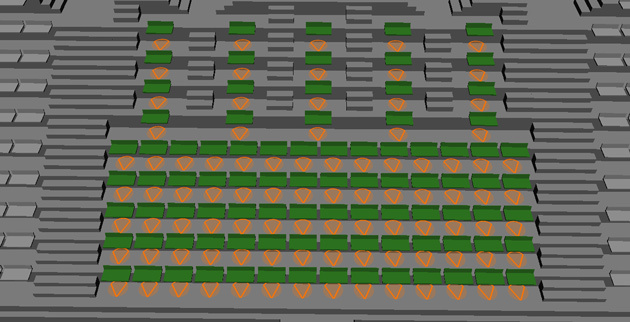 See an example below where we moved the population tool forward so that the characters are generated in front of the seats. 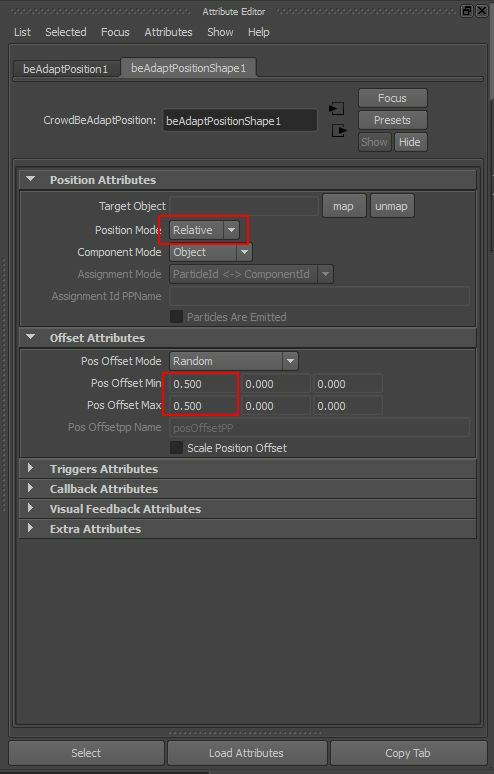 Assuming you have placed your entities based on polygons center and depending on your motions it may happen that you need to offset the characters before starting the motion. Indeed, when the simulation starts, a sit characters needs to have its root bone above the center of the seat, but a standing character needs to have it in front of the seat. Here is how to tweak their positions. Open the Behavior Editor , add a motion using a Motion Behavior. 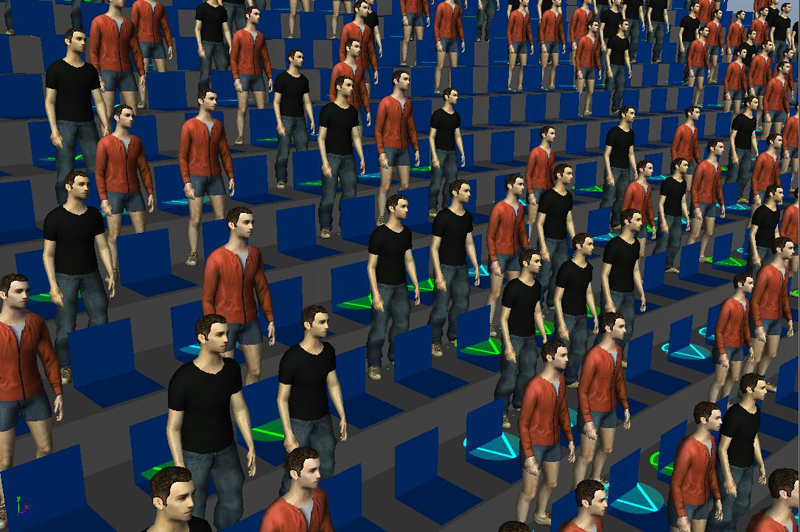 Your entities are now animated but still placed at the same position. In order to offset their positions, just add a Adapt Position Behavior before the Motion Behavior. Go into its attributes and set its mode to relative (character based) then edit its Random Position Offset (minimum and maximum can be the same values). Now your character are placed but doesn’t have any motions, this is due to the Adapt Position Behavior played endlessy, you will have to set an end Trigger. Edit the end Trigger of the Adapt Position Behavior, drop a Behavior Time Trigger, set it as Root Trigger and give it a value of some frames. Do not forget to deactivate “False”. Play again the animation, your characters are now placed and animated. 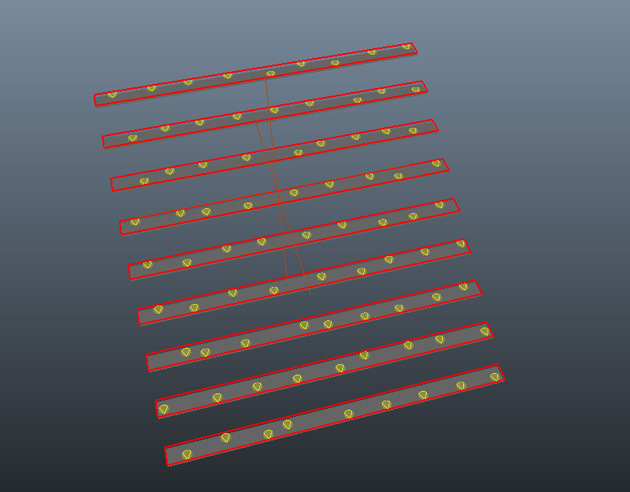 When it is not possible to use the component or object mode, you can compute a navmesh for your stands and place your characters using a regular population tool (most likely a point shape one if you want to be able to set a number of rows and columns). This placement mode also offers the advantage of being able to use noise without characters overlapping each others. 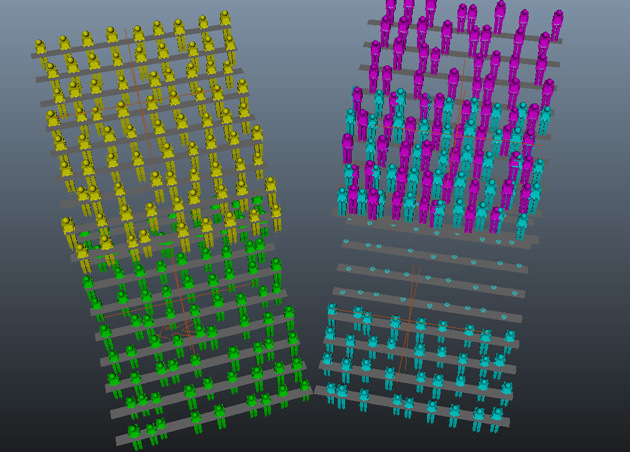 The first step is to select the stand mesh and to compute a navmesh (for this case I prefer to use the "Exact subdivision mode", you just need to uncheck the "Keep Only Greatest Connex Zone" in the Advanced Parameters tab). Then you can place a point shape population tool and adjust its number of row/columns, move it and adjust the distance between characters, to match your stands. Do not forget to adjust the particle radius as well so that they can fit into the stands. Notice that although we requested 12 columns, given the distance parameters, only 9 could be generated. 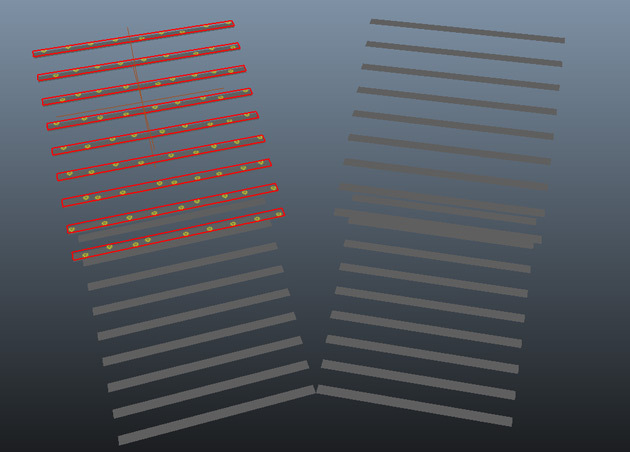 The advantage of using a navmesh is that the extra particles are not generated outside the stand. They are not generated at all. 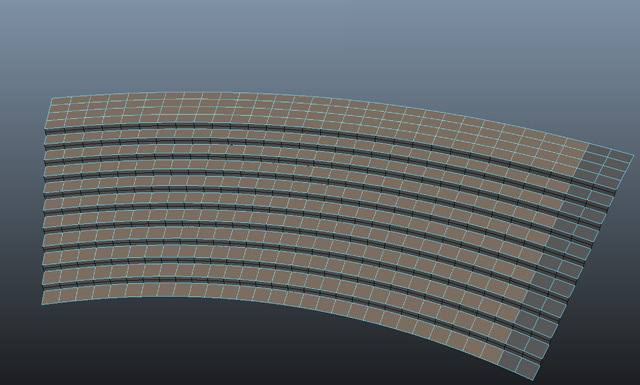 For example when using the navmesh method to place your characters, it can be useful to create more than one terrain. 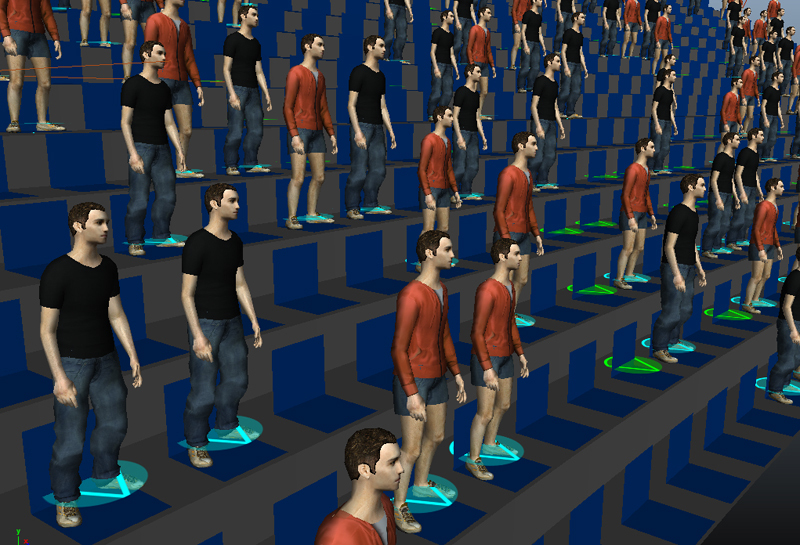 In the example below, we created only one terrain with all stands and try to generate people on the top stand. Unfortunately, depending on the parameters used, some characters may get generated on other stands. A clever solution for this case is to use a different terrain per particle tool. 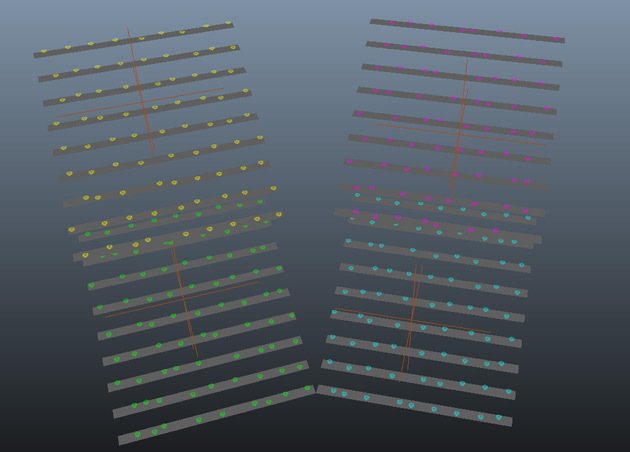 Here is the result when placing 4 particle tools, using one terrain per stand. A different Entity color has been used per particle, to show that there is no character generated outside of its relative stand. One important thing to note is that although it is possible to use multiple terrains for placement, only one terrain will be used during simulation. This terrain is used to correctly adapt the characters feet to the ground. 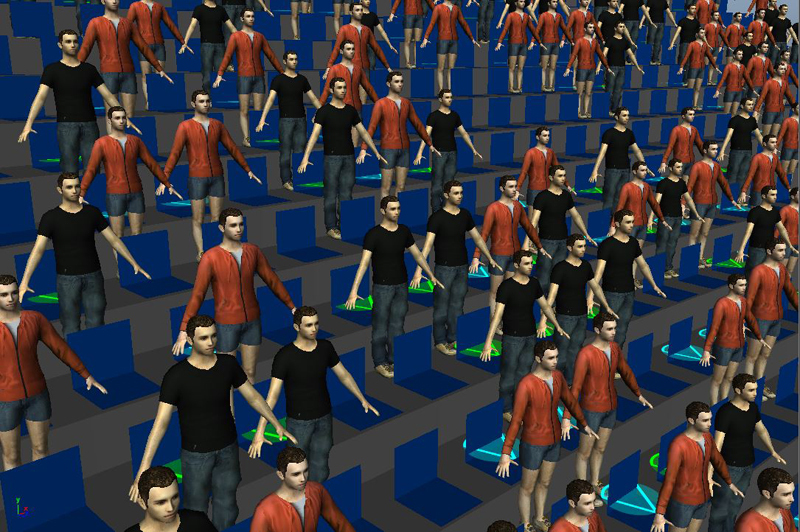 In our example, if the terrain used during simulation include only one stand, the characters on this stand will be generated correctly, but all other characters, not located on the covered zone, will be adapted incorrectly. 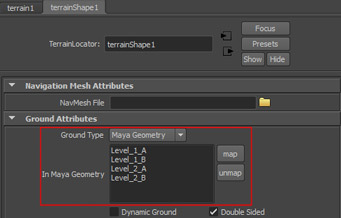 Note that if you are not using the Navigation or Goto Behaviors, you do not even need to provide a navmesh file for this terrain. 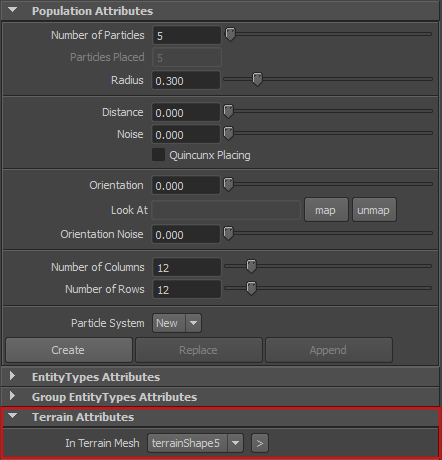 The terrain to be used during simulation is the one selected in the "In Terrain Mesh" attribute of the CrowdManager node.